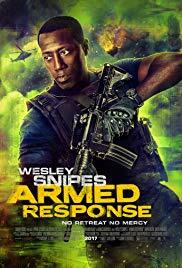 Wesley Snipes, Anne Heche, Dave Annable. In many ways this is a routine action film as the title suggests. The film shows an intelligence complex, with IT far more developed than expected, method for extracting truth from prisoners. Then there is an alarm, chases and deaths. The creator of the complex has suffered the death of his son in a road accident but is persuaded to come back because of the crisis. The creator is played by Dave Annable, the leader played by Wesley Snipes, the female lieutenant by Anne Heche. There are scenes of torture and truth extraction and the introduction of the theme of war in Afghanistan. The new troops arrive, investigate, discover the bodies, and then there is a flashback to a massacre in Afghanistan and the tone of the film changes completely, the troops being villains, the dead Afghanistanies ghosts wreaking revenge. The film is directed by actor John Stockwell who moved into directing mainly with smaller budget action films. 1. The title? An action show? The horror story – and its twist? 2. Most of the action confined to the complex, the nickname of the Temple, top technology, the interiors, the IT control? The flashbacks to Afghanistan, the action, military, victims? The musical score? 3. The opening, the military in the Temple, relaxing, the alarm, the response, aspects of terror, unseen killers, the killing of all the military? The recurring images throughout the film? Increasingly more graphic? 4. Introduction to Gabriel, riding bikes with his son, the stone unsettling the boy’s bike, the boy going down the hill, the accident, his death? Gabriel withdrawing? 5. Isaak, getting in touch with Gabriel, persuading him to come back? Reluctance? The story? The gathering together of the team? Their working together? The variety, racial backgrounds? The role of Riley? The presence of a woman? 6. Going to the Temple, the search, the mysteries? Discovering the bodies inside and outside? Gabriel and his young assistant? The work on the IT? The parcels? 7. The early scenes of interrogation, the technology to get the truth, its being visualised on screen? The torture and confrontation? The man from Afghanistan, his reputation, his entering into the United States? His presence in the Temple? Being apprehended, his being put in the vat, the information forthcoming? The mystery of his presence, the plan, his role? 8. The flashbacks to Afghanistan, the revelation of the team and their brutality, the massacre? 9. The appearances of the ghosts, the role of the Afghan man and his link with the military? Audience response to the revelation about the military and their brutality? 10. The ghosts, the pursuit? Isaak and his leadership, the twist in seeing him as a leader in Afghanistan? The other members? The role of Riley? 11. The mysterious behaviour, the death of Paul? Riley and the confrontation with the Afghan? 12. The buildup to the deaths, the vengeance of the ghosts? 13. Gabriel and his role, his being wounded? Riley and the clashes, her being on the side of good? 14. Destruction, vengeance? Armed response, ghost story, twists?